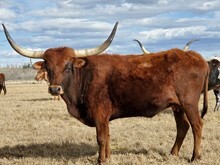 All Longhorns are listed for sale with a negotiable sale price. Call Cheri at 406-446-9090. Aspen is a big bodied Trail Dust granddaughter, with a lot of total horn with a twist. She raises big calves every year. 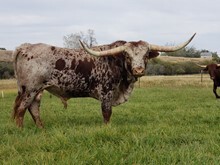 She sells with a bull out of M2 Tuff Luck, our big cowboy Tuff Chex son. Primrose is going to be a nice bodied cow. Trail Dust is packed in her Pedigree, She should come in with some nice horns, had a nic bull calf last year. She is a great mother. sells exposed to M2 Tuff Luck a Cowboy Tuff Chex son. For a 2019 spring calf. Begonia it is a nice big well built cow, with a lot of total horn. She raises us a nice big healthy calf for us every year, and is a great Milker. She sells with a bull calf by her side out of M2 Tuff Luck. 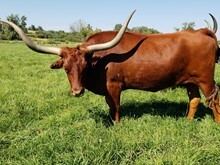 Sourdough has been a great producer for us, always has a nice big bodied calf. is quiet to work in the pens. We are keeping two of her daughters as replacements. She has been exposed to M2 Tuff Luck, our Cowboy Tuff Chex son for a 2019 late spring early summer calf. Tyme is granddaughter to Trail Dust and Pistol. Out one of my favorite cows. Always has a colorful calf. She sells exposed toTuff Luck, our Cowboy chex son. For a spring 2019 calf. Glory is a stout, and colorful heifer. Her horns are hooking back, and should have some good roll. She should be a great addition to any herd. 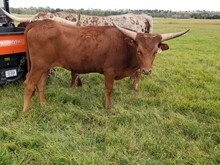 Cayanne is out of out big Trail Dust Daughter, and should grow into some nice horn, and good big bodied cow like her dam. She is due to calve, spring 2019 by Top Spot, our Top Caliber grandson. FOR SALE! Regrettably we are putting Spot up for sale. We won’t be able to use him next year. He threw us colorful well built calves this year. 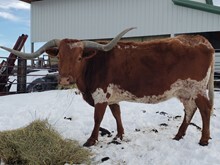 He is a super easy bull to work with, and stays put with his cows. If he is penned up has begging for treats down. 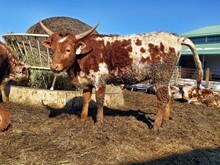 He will make a wonderful bull for a new herd of cows. He had given us a 100% calf crop of beautiful calves. We are keeping 12 of his heifers.